Sweden is located in Northern Europe, bordering the Baltic Sea, Gulf of Bothnia, Kattegat, and Skagerrak, between Finland and Norway, comprising of 449,964 sq km. It has a population of 9,001,774 (2005). 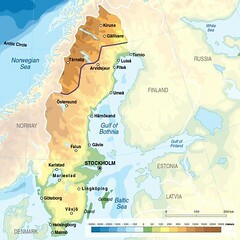 Major environmental concerns are: acid rain damage to soils and lakes; pollution of the North Sea and the Baltic Sea. Please note that the city of 'Linköping' is misspelled, and the city of Tornio is not located in Sweden.